Yesterday, Comcast activated a 2000Mbit fiber service at my home. 2000Mbits is fast enough to download an entire 1080p movie in 24 seconds or a 45GB video game in just 3 minutes. Here’s what I did to make it happen. 1 Static /48 IPv6 subnet. There are no data caps— even in markets that usually have data caps. 3–4 month lead time between first inquiry and activation date. $299.95 + equipment fees + taxes per month. I live on the periphery of the suburbs of Pittsburgh, Pennsylvania. About ten years ago, Verizon was rolling out Fiber to the Premises (FTTP) service everywhere around here. They were less than two miles from my house when the economy crashed and everything came to a halt. All around Pittsburgh, spools of unfinished fiber lay on the curbs for weeks and, in some cases, even months. Expansion was cancelled. I remained hopeful, for many years, that they would eventually expand their network to include my little town. Instead, Verizon refocused its attention to targeting customers in areas that already had their fiber. For the last few years, I’ve been running at 150Mbps download / 25Mbps upload over a coax connection. Even with owning my own modem, it costs me about $140/mo. through Comcast. There are no data caps in the Pittsburgh market. These speeds would be fine for the normal user, but I am not a normal user. I upload a lot! With faster Internet, I could host my own off-site backup servers, game servers and personal storage cloud. But I’m already pushing the limit of what 25Mbits can do. I noticed that after long periods (30+ minutes) of uploading at full speed, my modem would get hot and become unresponsive. Most people are not pushing their gear this hard. My solution, while inelegant, helped me squeeze every bit of efficiency that I could from my modem. Unfortunately, the object that I believed to be a “fiber tap” was not one at all. It was just a coax amplifier. 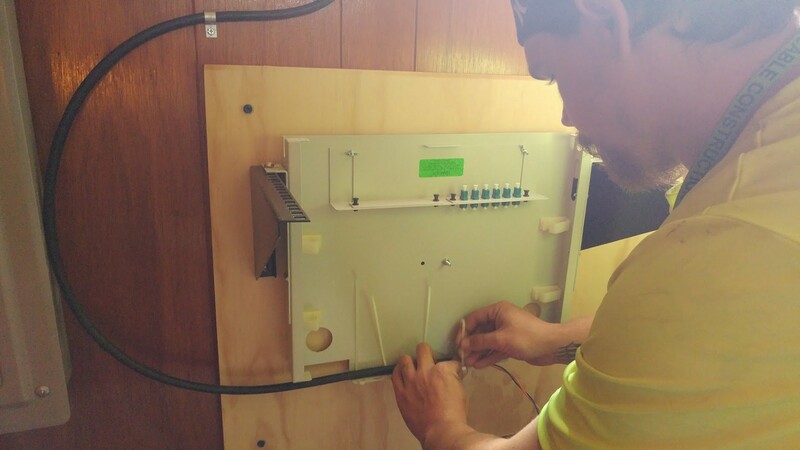 Fiber taps, known in the industry as a MUX, feed data to the coax lines all over town. The closest MUX to me was over 2500' (762m) away from my house. 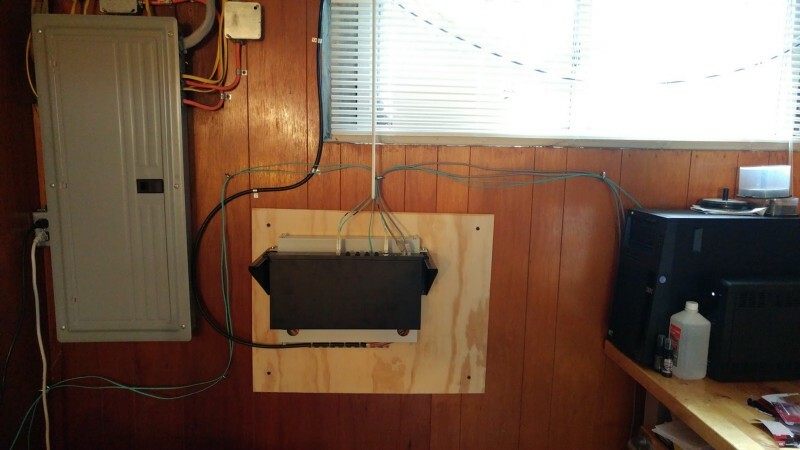 I was told that, because of the distance, my install costs would be around $18,000. Obviously not able to fork over $18,000 to Comcast, I moved on but never stopped trying to get faster Internet. I spent a considerable amount of time researching dark fiber and learning if other lesser-known companies have service in my area. I was even prepared to sign up for a more expensive business package if that was what it took. In April of this year, I found just such a company named Salsgiver. They have a fiber tap only five blocks from my house. Salsgiver provides Fiber to the Premises at speeds of 1000Mbit down / 100Mbit up for only $125/mo. However, they have a loosely-enforced data cap which could limit just how much uploading I’d do from that connection. Regardless, the price was amazing compared to my existing Comcast contract. Some of my neighbors and I submitted requests for Salsgiver service at our houses. Everyone on my street had expressed to me their interest in the service; for years, we have had only one option for Internet. I also shared info about Salsgiver on Facebook and got a considerable response from the local community. Unfortunately, Salsgiver said I was too far from the tap. 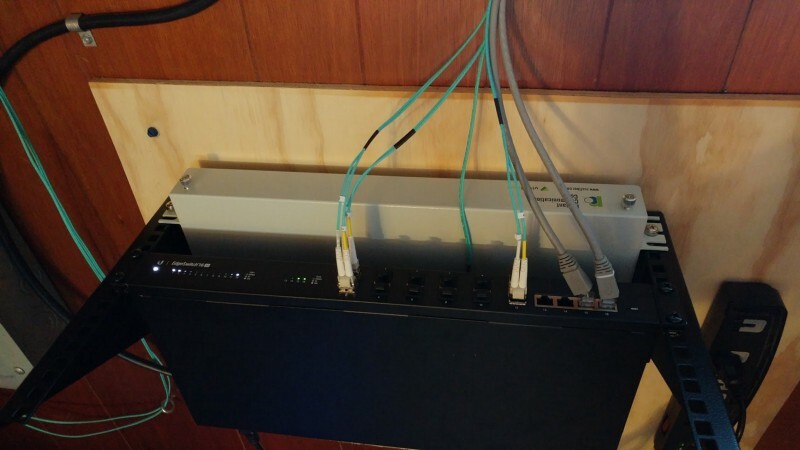 Because Salsgiver only extends their network for business customers, residential installs really need to be within about two blocks of an existing fiber tap. Looking at their business plans, for $300/mo., my speeds would only be 75Mbits down / 20Mbits up. Their same 1000Mbit down / 100Mbit plan that was only $125 for a residence cost $1500/mo. for a business. It was out of the question. I got the impression that Salsgiver is a great company. Everyone I talked to was really smart, the company was locally owned and operated and it just felt like such a good fit. I really wanted to give them a shot, but unfortunately, it wasn’t meant to be. Ever go to the fridge over and over again when you know there’s nothing good to eat inside? That’s how I felt on Comcast’s website. Every couple months, I’d enter my address to see if new service was available. And every time, it would be the same boring results. I shuffled between checking Comcast and Verizon FiOS for nearly ten years. But then something changed. One day, there was a new result hidden in the most inconspicuous part of the list. It was at the bottom of the “Internet Only” packages, which was harder to find since Comcast’s bundle-deal packages always dominate the results page. 2000Mbps Internet. $299.95. Call 1–800-XFINITY to order. I literally could not believe what I was reading. I immediately called. I made my initial inquiry about the product in early April. No one I talked to had any idea what I was talking about. I tried calling in again a week later and a week later until finally someone believed me. At one point, I remember telling an agent, “I’ll send you screenshots of your website, it says it’s available in my area.” I had experienced something similar years before when asking about the Extreme 505 package and was prepared to keep calling until I got the right person on the phone. 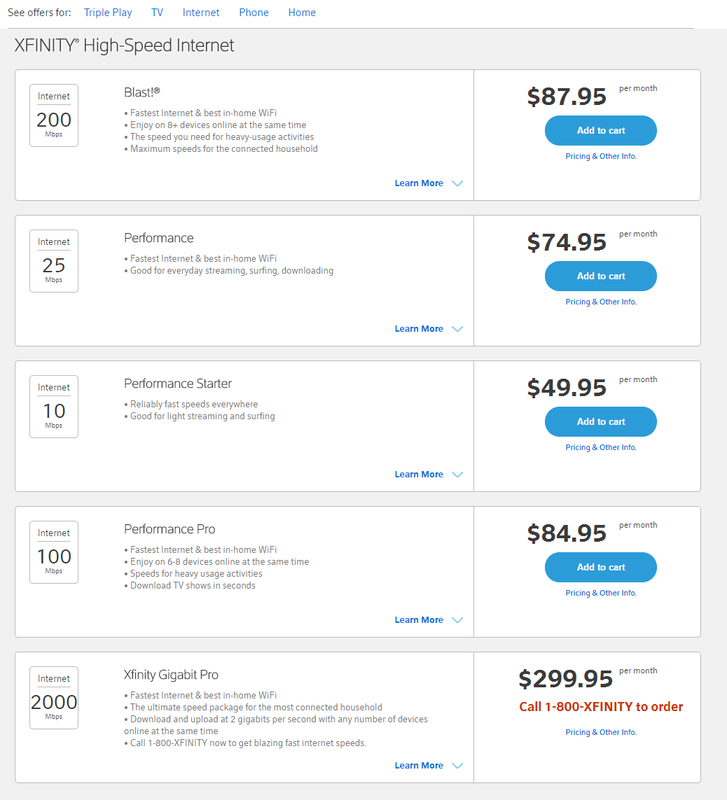 Despite listing the product on their website as 2000Mbps Internet, Comcast agents didn’t know it as such. Because I kept asking for 2000Mbps or 2Gbps service, the agents didn’t know what I was talking about. One agent was even surprised to learn that 2 gigabits was the same as 2000 megabits. It wasn’t until I used the product’s real name, Xfinity Gigabit Pro, that I was able to get through. I give credit to the poor Comcast agents who tried, albeit unsuccessfully, to help me. You have to imagine that so few people inquire about this service that taking a call about it must be like winning the lottery. There’s no way to be prepared for it, and if the caller doesn’t use the right keywords, you aren’t going to know what they are talking about. Finally, on April 21, I got through to a Comcast agent who knew what to do with my call. He informed me that someone from the Gigabit Pro team would be contacting me in the next two weeks to discuss pricing, availability, etc. The wait was on! Within less than two weeks, I heard from a Comcast rep named Sabrina. She sounded apprehensive as she explained the pricing and terms to me: $299.95/mo. with a $500 activation fee and $500 setup fee. (Yes, that’s right, $1,000 just to get the ball rolling.) In addition to these high prices, there was a 2-year contract. There was to be no haggling, no deal making; if I wanted the service, I had to pay it. She told me outright that there was usually a 3–4 month lead time. I got the impression most of her customers bailed when they heard the conditions. Not me. I told her that would all be fine, as I would mostly be using Internet for my business at home, so the cost could be justified. She seemed both surprised and pleased that I wanted to move forward. She explained to me that Comcast must, first, do an internal survey. Their internal survey really boils down to measuring the distance, pole-to-pole on Google Maps, from their closest tap to my house. If the distance was within range, they would call me to set up an on-site survey. A week or so later, Sabrina called to tell me that I passed the internal survey by the skin of my teeth. At 1,700' (518m), I was just a tad over the maximum distance. Despite being over, she approved me for an on-site survey anyways. She told me to expect a call from a local contractor who would do the survey. She also provided me with her direct line and email address. Having her contact info lets me bypass the usual Comcast agents when I wanted a status update on my order. I’ve also been able to give her info to friends who are looking to get the Gigabit Pro service, but didn’t want to get stuck behind the regular wall of Comcast agents. A couple weeks later, a local contractor from Duda Cable Construction showed up to ask me questions about my house. 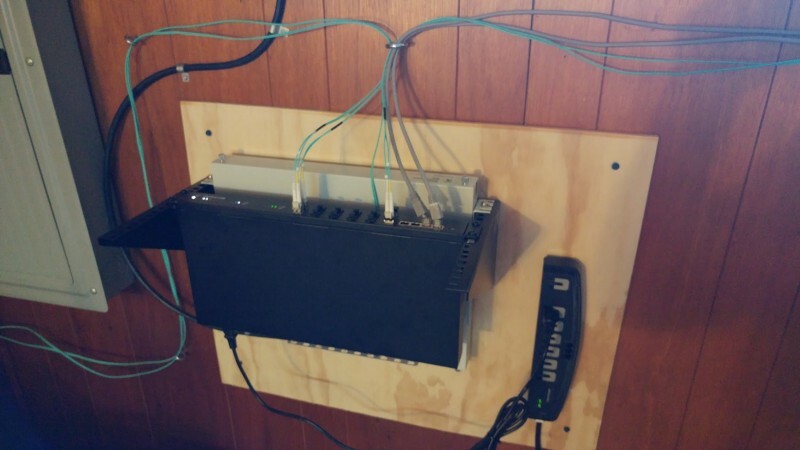 After looking around, we decided on a location in the basement to install their equipment. He was kind enough to show me a fiber map of my hometown with all the details you could imagine: dark fiber, fiber taps, everything that involved bringing Internet to people. As someone who designs and implements networks inside of buildings, it was really interesting to see the wiring of a whole town. It was the call I was expecting. This was the furthest I’d ever gotten, so I knew that I was about to be let down again. Sabrina called to tell me the bad news. We were over budget. Knowing this could happen, I had been recruiting friends to call Sabrina and inquire about the 2Gbit service. They were all seriously interested, but not all were close enough to fiber taps to matter. Because I had sent over some referrals to Sabrina, and because she could see my past history with Comcast, she told me that she was going to try to fight the denial. I have a 15+ year old account and their records show that I have called dozens of times over the years for faster service. After another couple weeks of getting nowhere, I called her and asked how far apart the numbers were. “$503.” That was it. That was how much over budget they were. I wasn’t happy about it, but I said, “What if I just pay the $500? Can we do it then?” She really didn’t know what to say because it was not an ordinary request. She had to talk to some people and get back to me. A week later, I was told to expect a call from Comcast’s billing department. Sure enough, they called and charged my credit card for $503. The install was back on! A few days later, a project manager reached out to explain what was next. I eagerly awaited for the work to begin. 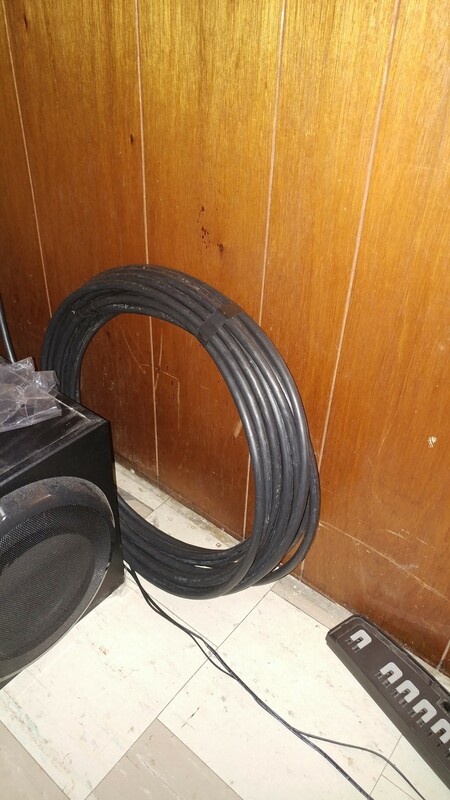 … to run fiber to my house. I got a kick out of the fact that everyone’s morning commute was slightly delayed because I was getting an Internet upgrade. Duda Cable started at my house and pulled fiber pole-to-pole to the closest tap. Now here is where it gets interesting — I am a little bit fuzzy on details at this point — but I believe that Duda discovered the fiber tap was at max capacity once they had already pulled my cable there. (Or maybe Comcast discovered it after we had signed a contract; I don’t know.) Details aside, Duda had to pull another 900' (275m) to run my line to the next closet tap. Had Comcast realized, during the on-site survey, that they would need to pull an additional 900', I am certain that I would have been denied for fiber. It was starting to feel like luck was on my side. When they eventually completed pulling fiber the entire way across town, a large spool of fiber hung from the pole outside my house. I could see it, but I couldn’t use it yet. It was both wonderful and terrible at the same time, like Christmas morning as a child, before your parents wake. Not even a week later, two techs from Duda Cable came to my house. 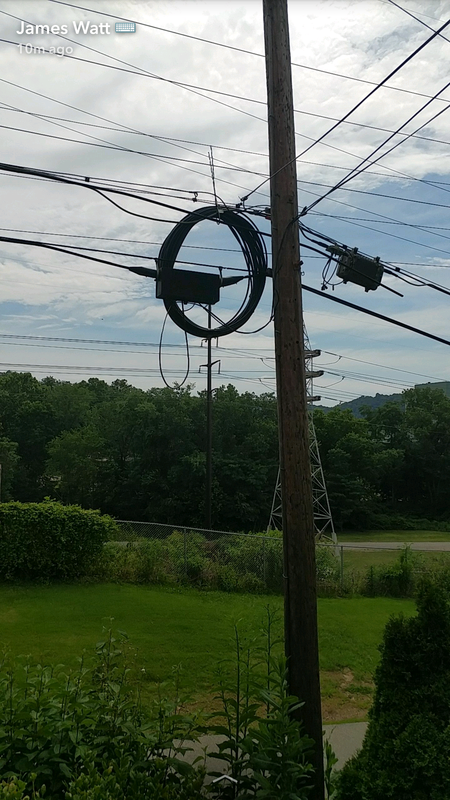 They hung high-tension cable between the corner of my house and the telephone pole and strung the fiber line across it. They affixed the fiber to my siding and then drilled into the basement. Mike and Kevin, the guys from Duda Cable, were incredibly talented at their job. As someone who runs cabling indoors for a living, I was very impressed and pleased with the job they did. Their install was neat and orderly both inside and outside my house. 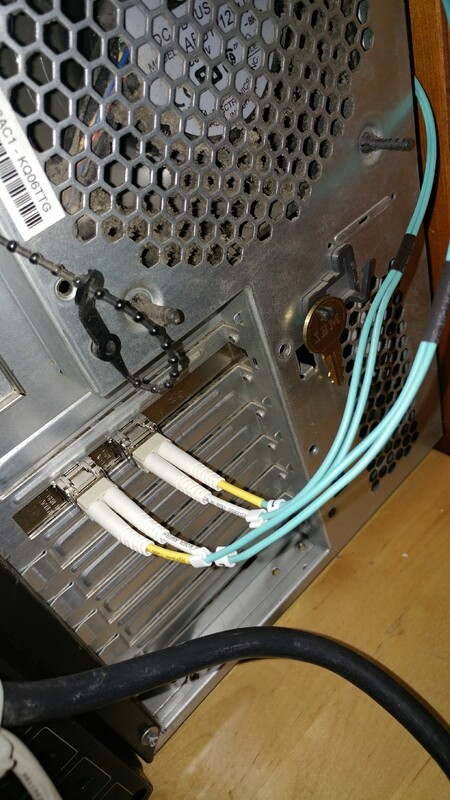 They spooled up the fiber on my basement floor, but did not terminate or activate it. It wouldn’t have mattered if they had, anyways, since Comcast hadn’t provided the equipment yet. So now instead of looking at it hanging from the pole, I had to look at it in my basement. It was getting so close! How do I use 2 gigabits? My Comcast project manager, Daniel, explained that they would be installing a Juniper ACX2100 layer 2 switch. I could use either a 1Gbit Ethernet port or a 10Gbit MultiMode Fiber port. I actually had no idea how I would utilize 2 gigabits of bandwidth. My network, like most networks, was just 1GbE (1 gigabit Ethernet.) That means that I’d only be able to take advantage of half the speed they were giving me. In reality, I will very rarely ever use more than one gigabit of data for any single connection. But why pay for two gigabits and only use one? It was time to consider upgrading my home office LAN to 10Gbit. Warning in advance: the next two paragraphs are very technical. Feel free to skim where necessary or skip altogether. The story continues below. I looked at two solutions, both of which were more expensive than I had liked. 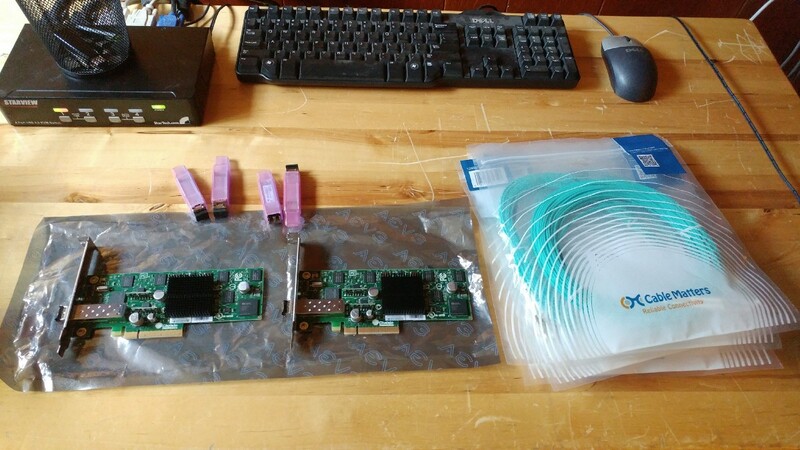 The first was to get 10GbE Ethernet cards for each PC using the newer Cat6A copper cabling. It was very similar as well as backwards compatible with most of the 1GbitE gear I already had at the house. I would need a new switch, new Ethernet cables and new cards for each computer. The other solution was to purchase Converged Network Adapters for each PC and run MultiMode Fiber (MMF) instead of Cat6A. 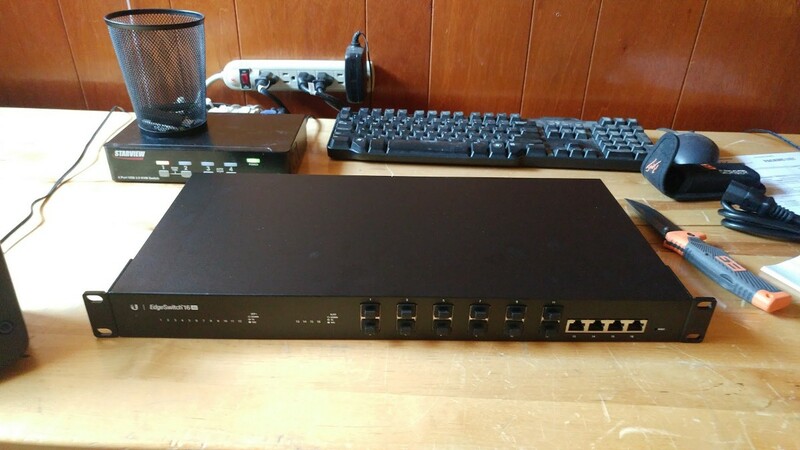 To connect everything together, I needed an affordable switch with a dozen or so SFP+ ports and the 10Gbit MMF transceivers to match. The transceivers get installed into the SFP+ ports on the switch as well as into the Converged Network Adapters in each PC. If that wasn’t enough, I also needed a router with dual SFP+ ports to route between my Local Area Network and Comcast. 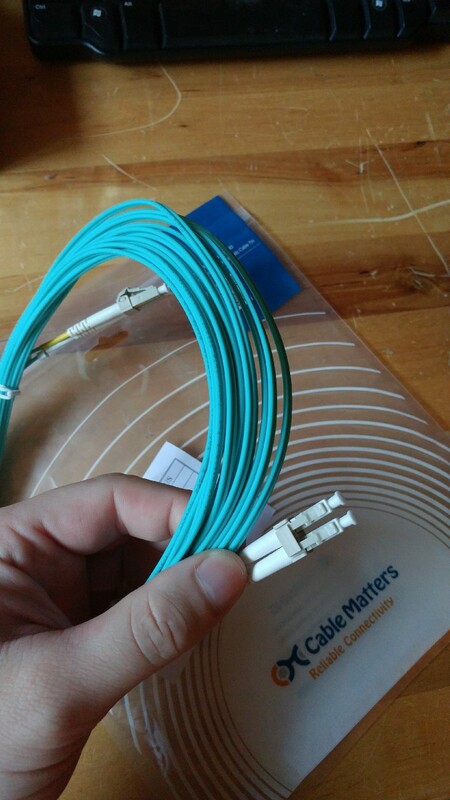 I decided to go with the second solution and ordered a Dual Port Converged Network Adapter for my router, along with 10Gbit MMF transceivers and patch cables. 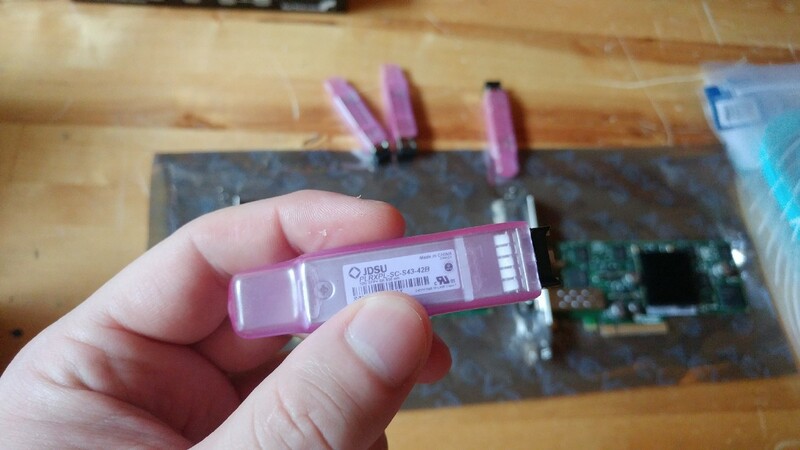 My luck continued when a buddy of mine told me that he had a box of surplus Converged Network Adapters along with 10Gbit MMF transceivers that were not being used. He gave them to me free of charge! 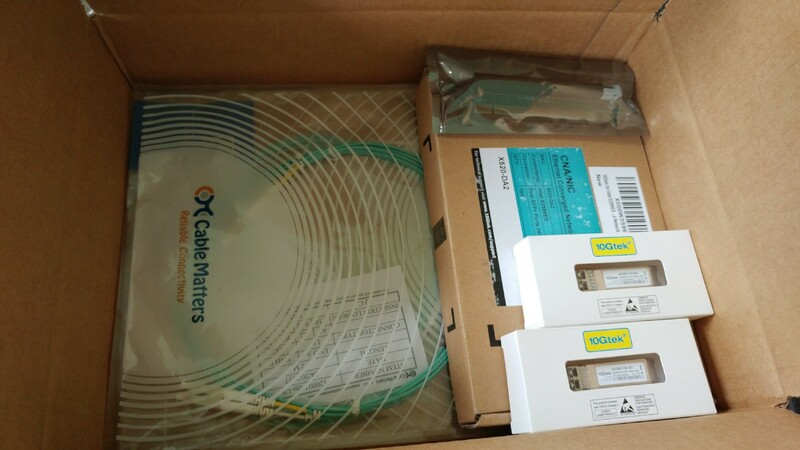 All I had to do was order some patch cables from Amazon and I‘d have everything I needed to setup the 10Gbit LAN. Just three patch cables still ended up being a staggering $60. MMF Transceivers (left) get installed into the Converged Network Adapters. MMF Patch cables (right) connect everything together. 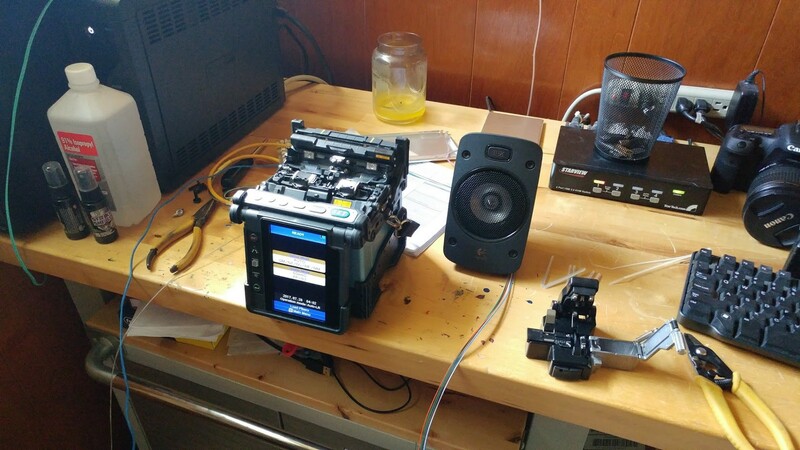 My router is probably not what you imagine when you read the word “router.” I am using a full tower PC to route between the Internet and my Local Area Network. 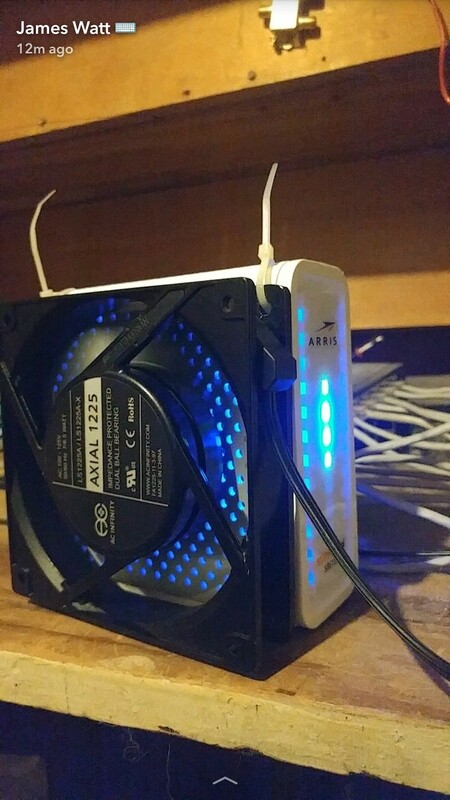 I do this by utilizing two network ports in a dedicated computer that runs a specialized version of the FreeBSD operating system known as pfSense. It would cost at least $1,800 to buy a pre-built, open-source router with dual 10Gbit MultiMode Fiber ports. The price skyrockets to over $10,000 for the same thing from name brands like Cisco and Juniper. 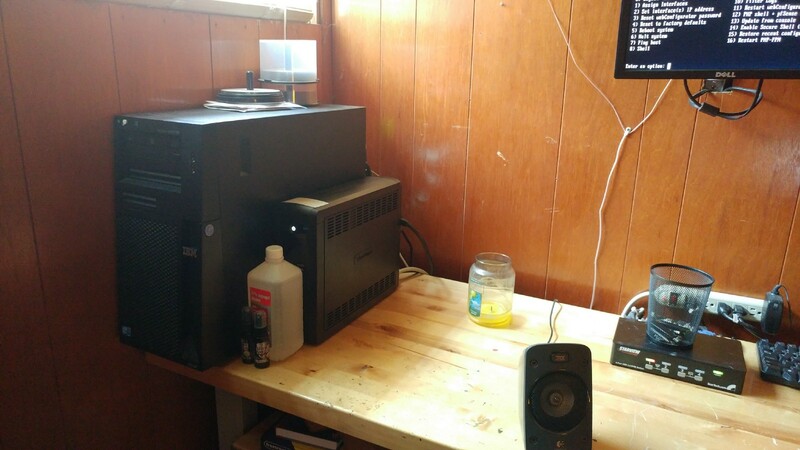 Instead, I used an old IBM server with an Intel Xeon Quad-core CPU @ 2.4GHz & 16GB of RAM. These specs are ridiculously overkill for a router, but it was the only reliable computer that I had laying around. All I had to do was install the card, plug in the fiber cables and configure pfSense. 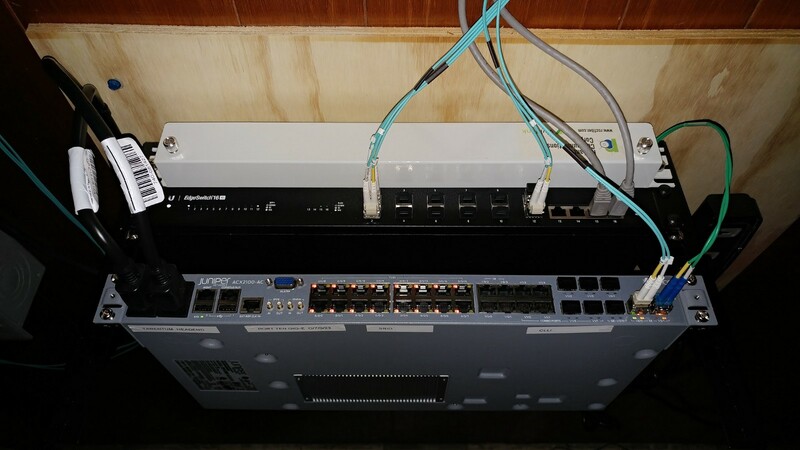 I connected two of my legacy 1Gbit switches to the new Ubiquity switch using the four provided Ethernet ports. 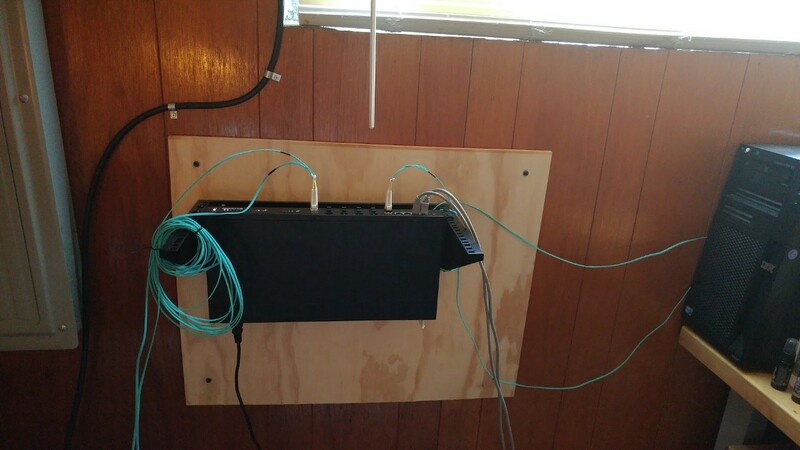 I connected each of my main office computers and the router’s “LAN port” to the switch using 10Gbit MultiMode Fiber. 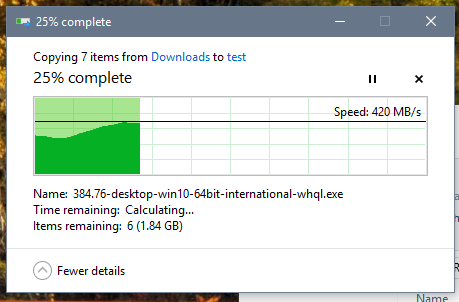 I ran a quick test to see if I could notice 10Gbit. I copied a bunch of junk from my main workstation to my storage server. The files copied at around 420Mbytes/sec (3.5Gbits/sec), which is the maximum read speed on my workstation’s solid state drive. Very impressive! For the time being, I connected my existing cable modem to my router’s 1Gbit network card. This allowed me to route my existing 150/25 Internet connection over the new 10Gbit LAN while I waited for Comcast to complete my install. Duda Cable returned, in less than two weeks, to terminate the lines. This was done by splicing the strands from the street to much smaller “patch strands” that are housed in this box. Even though I’m only using two strands, the technician spliced six. The others serve as backup in the event of a strand going bad. Each strand was spliced and tested using equipment more expensive than most cars. When the tech left, I took the opportunity to do some much-needed cable management. Not only does it look nicer, but it keeps the cables from getting snagged and damaged. 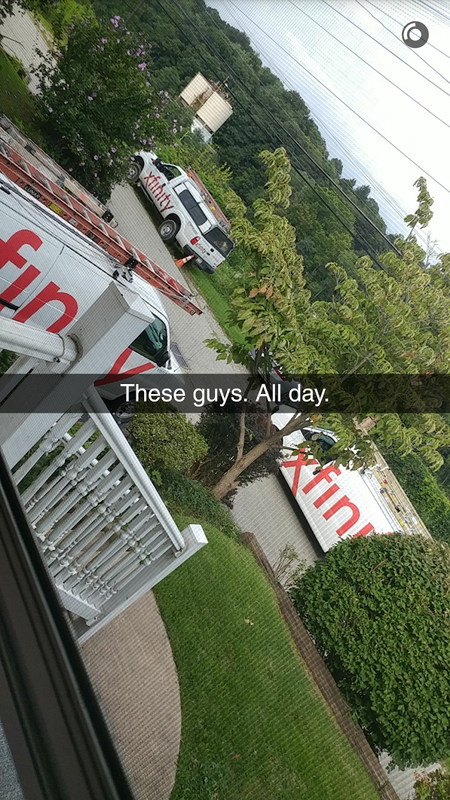 On Monday, August 7th, three Comcast agents arrived to install the service. One was the supervisor for my region. They explained that this was the first residential fiber install in the region, so, they all wanted to be on site for it. I felt a little bit like a celebrity. Pretty much immediately, there was an issue. The switch didn’t have link activity. That means Comcast’s network wasn’t seeing my switch. They would need to send someone to the Head-End to investigate. The Head-End is where all of their fiber terminates. In my case, the Head-End was located ~5 miles away. More techs arrived to work on the problem while other techs drove to the Head-End. 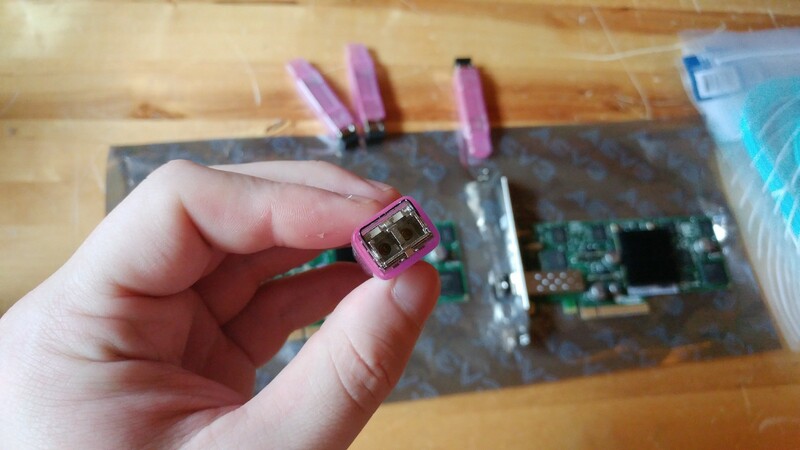 They swapped patch cables, transceivers, and tried different ports until they found the problem: the transceiver at the Head-End was either broken or incompatible. After replacing the transceiver, we had link activity. But, we weren’t out of the woods, yet. Before they can hand off service to me, Comcast is required to do an RFC2544 test. If you don’t know what that is, don’t worry; I had never heard of it, either. Basically, it is a test to validate that the connection is stable and runs at a full 2000Mbits. They had a heck of time trying to test such a fast connection. Their tester, a JDSU T-berd 5800, was built to mostly test 1Gbit service. In it’s current configuration, it was unable to run the 2Gbit test required for my install. But, they came up with a plan to make it work. The solution required only a handful of parts, but these aren’t the kind of parts you can get at Best Buy or Staples. The supervisor made some calls, which lead to more Comcast trucks arriving at my house. Techs were showing up with spare parts trying to make everything work. After a few tries with various configurations, a working solution was put into place. The test was successful! I am really appreciative that the techs tolerated me — I realize how difficult it must be to do an install with an IT geek over your shoulder. I thought they were very easy to get along with and extremely knowledgeable. Even though there were some issues, they didn’t give up and were able to complete the job in a single day. The supervisor, Chuck, stayed til the very end to make sure things went well. Obtaining fiber service from Comcast is not for the faint of heart. Maybe in the future, it will be easier to purchase and more affordable, but for now, only enthusiasts with serious dedication are going to reap the rewards. Despite the long lead times and cost, I am extremely happy with how Comcast handled the entire process. 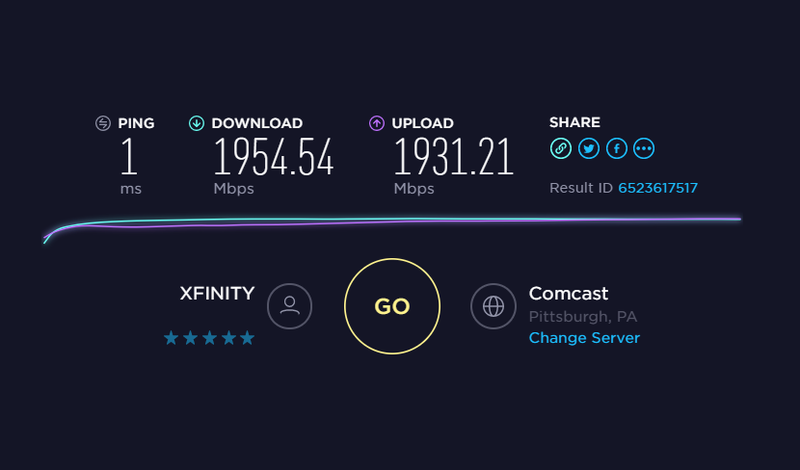 I am a very happy Comcast customer! Now please excuse me — I have to go and download the entire Internet.